Published on September 11, 2014 in California Builder & Engineer, Daily Dirt and National. Closed Tags: American Association of State Highway and Transportation Officials (AASHTO), bridges, Bureau of Transportation Statistics (BTS), California Department of Transportation (Caltrans), concrete, construction, construction industry, contractors, economy, employment, Federal Highway Administration (FHWA), Highway Bill, highways, Interstate Highway System, jobs, National Highway Traffic Safety Administration (NHTSA), pavement, roads, Texas Transportation Institute (TTI), transportation, TRIP, U.S. Census Bureau. Roads and bridges that are deficient, congested or lack desirable safety features cost California motorists a total of $44 billion statewide annually – as high as nearly $2,500 per driver – due to higher vehicle operating costs, traffic crashes and congestion-related delays. Increased investment in transportation improvements at the local, state and federal levels could relieve traffic congestion, improve road and bridge conditions, boost safety, and support long-term economic growth in California, according to a new report released today by TRIP, a Washington, DC based national transportation organization. The TRIP report, “California Transportation by the Numbers: Meeting the State’s Need for Safe and Efficient Mobility,” finds that throughout California, 34 percent of major urban roads and highways are in poor condition. More than a quarter of California’s bridges are structurally deficient or functionally obsolete. The state’s major urban roads are becoming increasingly congested, with drivers wasting significant amounts of time and fuel each year. And California’s rural non-interstate traffic fatality rate is more than four times the fatality rate on all other roads in the state. Driving on deficient roads costs each California driver as much as $2,458 per year in the form of extra vehicle operating costs (VOC) as a result of driving on roads in need of repair, lost time and fuel due to congestion-related delays, and the cost of traffic crashes in which roadway features likely were a contributing factor. The TRIP report calculated the cost to motorists of insufficient roads in California’s largest urban areas: Los Angeles, Sacramento, San Diego, San Francisco-Oakland and San Jose. A breakdown of the costs per motorist in each area along with a statewide total is below. The TRIP report finds that a total of 34 percent of major roads in California are rated in poor condition, while an additional 41 percent of the state’s major roads are rated in mediocre or fair condition and the remaining 25 percent are rated in in good condition. A total of 28 percent of California’s bridges show significant deterioration or do not meet modern design standards. Eleven percent of California’s bridges are structurally deficient, with significant deterioration to the bridge deck, supports or other major components. An additional seven percent of the state’s bridges are functionally obsolete, which means they no longer meet modern design standards, often because of narrow lanes, inadequate clearances or poor alignment. Traffic crashes in California claimed the lives of 14,878 people between 2008 and 2012 California’s non-Interstate rural roads are particularly deadly, with a fatality rate in 2012 of 2.61 traffic fatalities per 100 million vehicle miles of travel, more than four times the fatality rate of 0.63 on all other roads and highways in the state. California’s overall traffic fatality rate of 0.88 fatalities per 100 million vehicle miles of travel is lower than the national average of 1.13. The efficiency of California’s transportation system, particularly its highways, is critical to the health of the state’s economy. A 2007 analysis by the Federal Highway Administration found that every $1 billion invested in highway construction would support approximately 27,800 jobs. The Federal surface transportation program is a critical source of funding in California. From 2008 to 2012, the federal government provided $1.32 for road improvements in California for every dollar the state paid in federal motor fees. Congress recently approved an eight-month extension of the federal surface transportation program, which will now run through May 31, 2015. The recent legislation will also transfer nearly $11 billion into the Highway Trust Fund (HTF) to preserve existing levels of highway and public transportation investment through the end of May 2015. 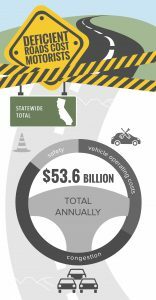 $44 billion Driving on deficient roads costs California motorists a total of $44 billion annually in the form of additional vehicle operating costs (VOC), congestion-related delays and traffic crashes. $1,723 TRIP has calculated the cost to the average motorist in California’s largest urban areas in the form of additional VOC, congestion-related delays and traffic crashes. The average Los Angeles driver loses $2,485 each year; each Sacramento motorist loses $1,543 annually; each San Diego driver loses $1,886 annually; each driver in San Francisco-Oakland area loses $2,206; and each San Jose driver loses $1,723. 14,878 On average, 2,976 people were killed annually in California traffic crashes from 2008 to 2012, a total of 14,878 fatalities over the five year period. 4X The fatality rate on California’s non-interstate rural roads is more than four times higher than that on all other roads in the state (2.61 fatalities per 100 million vehicle miles of travel vs. 0.63). $1.28 trillion Annually, $1.34 trillion in goods are shipped from sites in California and another $1.28 trillion in goods are shipped to sites in California, mostly by truck. 28 % A total of 28 percent of California bridges are in need of repair, improvement or replacement. Eleven percent of the state’s bridges are structurally deficient and 17 percent are functionally obsolete. 39 hours The average driver in the Los Angeles urban area loses 61 hours each year as a result of traffic congestion; each Sacramento area driver loses 32 hours annually; each San Diego area motorist loses 37 hours each year; each driver in San Francisco-Oakland area wastes 61 hours annually in congestion; and the average San Jose area motorist loses 39 hours. 27,800 jobs An analysis by the Federal Highway Administration found that every $1 billion invested in highway construction would support approximately 27,800 jobs, including approximately 9,500 in the construction sector, approximately 4,300 jobs in industries supporting the construction sector, and approximately 14,000 other jobs induced in non-construction related sectors of the economy. From 2008 to 2012, the federal government provided $1.32 for road improvements in California for every dollar paid in California in federal motor fuel fees. California’s extensive system of roads, highways and bridges provides the state’s residents, visitors and businesses with a high level of mobility. This transportation system forms the backbone that supports the state’s economy. California’s surface transportation system enables the state’s residents and visitors to travel to work and school, visit family and friends, and frequent tourist and recreation attractions while providing its businesses with reliable access to customers, materials, suppliers and employees. As California looks to retain its businesses, maintain its level of economic competitiveness and achieve further economic growth, the state will need to maintain and modernize its roads, highways and bridges by improving the physical condition of its transportation network and enhancing the system’s ability to provide efficient and reliable mobility for motorists and businesses. Making needed improvements to California’s roads, highways and bridges could also provide a significant boost to the state’s economy by creating jobs in the short term and stimulating long term economic growth as a result of enhanced mobility and access. 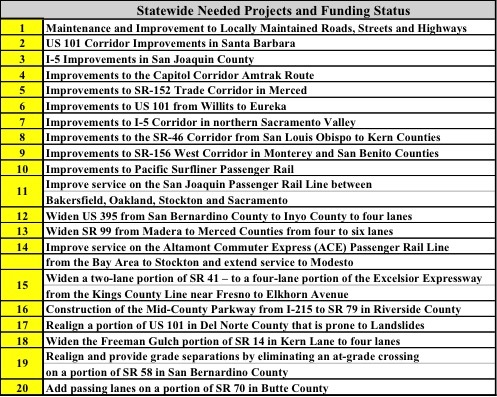 The level of funding and the provisions of the federal surface transportation program have a significant impact on highway and bridge conditions, roadway safety, transit service, quality of life and economic development opportunities in California. An inadequate transportation system costs California residents a total of $44 billion every year in the form of additional vehicle operating costs (VOC), congestion-related delays and traffic crashes. TRIP estimates that California roadways that lack some desirable safety features, have inadequate capacity to meet travel demands or have poor pavement conditions cost the state’s residents approximately $44 billion annually in the form of additional vehicle operating costs (including accelerated vehicle depreciation, additional repair costs, and increased fuel consumption and tire wear), the cost of lost time and wasted fuel due to traffic congestion, and the financial cost of traffic crashes. TRIP has calculated the average cost to drivers in the state’s largest urban areas as a result of driving on roads that are deteriorated, congested and lacking some desirable safety features. The chart below details the costs to drivers in the Los Angeles, Sacramento, San Diego, San Francisco-Oakland and San Jose urban areas. Population and economic growth in California have resulted in increased demands on the state’s major roads and highways, leading to increased wear and tear on the transportation system. California’s population reached approximately 38 million residents in 2012, a 28 percent increase since 1990. California had 24,200,997 licensed drivers in 2012. Vehicle miles traveled (VMT) in California increased by 26 percent from 1990 to 2012 – from 259 billion VMT in 1990 to 326 billion VMT in 2012. By 2030, vehicle travel in California is projected to increase by another 20 percent. From 1990 to 2012, California’s gross domestic product, a measure of the state’s economic output, increased by 45 percent, when adjusted for inflation. A lack of adequate state and local funding has resulted in more than one-third of major roads and highways in California having pavement surfaces in poor condition, providing a rough ride and costing motorist in the form of additional vehicle operating costs (VOC). Driving on rough roads costs all California motorists a total of $17 billion annually in extra VOC. Costs include accelerated vehicle depreciation, additional repair costs, and increased fuel consumption and tire wear. Twenty-eight percent of locally and state-maintained bridges in California show significant deterioration or do not meet current design standards often because of narrow lanes, inadequate clearances or poor alignment. This includes all bridges that are 20 feet or more in length. Eleven percent of California’s bridges are structurally deficient. A bridge is structurally deficient if there is significant deterioration of the bridge deck, supports or other major components. Structurally deficient bridges are often posted for lower weight or closed to traffic, restricting or redirecting large vehicles, including commercial trucks and emergency services vehicles. 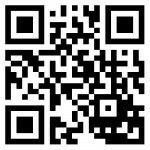 Between 2008 and 2012 a total of 14,878 people were killed in traffic crashes in California, an average of 2,976 fatalities per year. California’s overall traffic fatality rate of 0.88 fatalities per 100 million vehicle miles of travel in 2012 is lower than the national traffic fatality rate of 1.13. The fatality rate on California’s rural non-Interstate roads was 2.61 fatalities per 100 vehicle miles of travel in 2012, more than four times the 0.63 fatality rate on all other roads and highways in the state. The chart below details the average annual number of hours lost to congestion by each motorist in California’s largest urban areas, as well as the annual congestion cost per driver in the form of lost time and wasted fuel. The efficiency of California’s transportation system, particularly its highways, is critical to the health of the state’s economy. Businesses are increasingly reliant on an efficient and dependable transportation system to move products and services. A key component in business efficiency and success is the level and ease of access to customers, markets, materials and workers. Annually, $1.34 trillion in goods are shipped from sites in California and another $1.28 trillion in goods are shipped to sites in California, mostly by truck. Sixty-seven percent of the goods shipped annually from sites in California are carried by trucks and another 20 percent are carried by courier services or multiple mode deliveries, which include trucking. A 2007 analysis by the Federal Highway Administration found that every $1 billion invested in highway construction would support approximately 27,800 jobs, including approximately 9,500 in the construction sector, approximately 4,300 jobs in industries supporting the construction sector, and approximately 14,000 other jobs induced in non-construction related sectors of the economy. The federal government is a critical source of funding for California’s roads, highways and bridges and provides a significant return in road and bridge funding based on the revenue generated in the state by the federal motor fuel tax. From 2008 to 2012, the federal government provided $1.32 for road improvements in California for every dollar the state paid in federal motor fuel fees. Sources of information for this report include the California Department of Transportation (Caltrans), the Federal Highway Administration (FHWA), the Bureau of Transportation Statistics (BTS), the U.S. Census Bureau, the American Association of State Highway and Transportation Officials (AASHTO), the Texas Transportation Institute (TTI) and the National Highway Traffic Safety Administration (NHTSA). All data used in the report is the latest available.